Do Manchester United get easier cup draws? Have United consistently had the luck of the draw? A new season, but the same old grumbling about perceived bias towards Manchester United continues. Sometimes opposition fans have a case – think the now defunct ‘weakened team’ rule – but are claims that United consistently receive favourable draws in any way justified? I’ve run the numbers for both the FA Cup and Champions League for recent seasons; despite the small samples hopefully there’s an obvious trend. UEFA’s club coefficient gives us a pretty handy measure of draw strength. Each team is awarded points for its performance in Europe each season, giving a five-year rolling ranking to determine the seeding for the group draw. Outlined in the table below is the average coefficient of the three teams in each of the English clubs’ groups from the 2004/05 season onwards. Highlighted in bold is the lowest average coefficient for each category. You can find the team rankings here for some context. The country component of the team coefficient changed for the 2004/05 season, and then again from the 2009/10 season, hence the split in the table. Accounting for both the seeding (i.e. pot one or otherwise) and season, statistically there is no evidence Manchester United consistently draw teams with lower coefficients, compared to fellow Premier League teams. 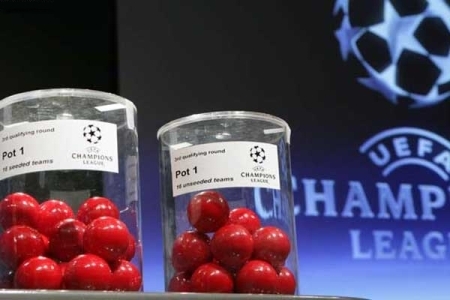 United may have received marginally the easiest draw this season, but in the previous two years it was Chelsea who could claim to be the luckiest in this respect. Equally there’s nothing to suggest that United tend to draw the weaker teams in any of pots two, three and four. So that clears up a UEFA conspiracy. Unlike the Champions League tables, here the lower the number, the harder the draw should be. Again, we’re dealing with small samples but nevertheless there’s nothing to suggest United have had easier draws in the cup during this period. Generally in the last eight seasons the ‘big four’ have all benchmarked themselves against one another, and although this is now changing it seems to me to be the easiest way of comparison. Actually, of the 33 FA Cup matches Man United have played during this period, 25 have been against Premier League opposition, though obviously many of these matches have been in later rounds. Arsenal can perhaps consider themselves unlucky; Chelsea have had statistically significantly easier draws in the third round, though both teams have progressed from this round in each of the last eight years. Clearly it’s a minority who truly believe in a conspiracy (though some of the thoughts on this Talksport comment feed are quite amusing), but hopefully the numbers clear up a blatant Manchester United bias. Essentially, most fans point out when United receive a supposedly easier draw and keep quiet when they don’t get the rub of the green. Unlike on the field, you can’t make your own luck in random draws, and the numbers reflect that. ← Do goals from midfield matter? True – they reflect performance in Europe and give no idea of ‘danger’ teams like Man City, but by and large they reflect quality because generally the same top tier of teams have qualified season after season – Dortmund and City may suggest this is changing. Second, it’s possible to “build up” coefficient through Europa League like CSKA, Sevilla.. although those clubs didn’t have any success in CL when they entered this competition. Anyway, KUTGW… I like you blog… Greetings from Croatia! Thanks. Like you say, they’re a good point to start and probably the best measure we have of team capability. Lots of things unaccounted for – new, highly-rated managers/signings for example. English clubs have generally done well in Europe regardless of group draw though, which is worth remembering too.